One of the greatest operatic basses of his generation and beyond (...) his latest disc celebrates the naturalness of his art. (...) Under John Storgårds's baton, the Helsinki Philharmonic accompanies Salminen generously. Salminen's experience with lighter music since his youth ads a popular and retro-style sound to these songs. His long opera career enables him to a comprehensive, clear scale of expression. And then there is Salminen’s warm, resounding voice. The 63-year-old bass is in top form. The Helsinki Philharmonic Orchestra under John Storgårds exhibit (...) sumptuous sound. Matti Salminen is an acoustic phenomenon and possibly the finest authentic bass singer of our time. The winner of two Grammies owes his legendary reputation to a uniquely powerful and dark voice, and he continues to sing Wagner, Mozart and Mussorgsky roles at nearly every prominent opera house and concert hall in the world. It is known that the scheduling of Wagner operas at the New York Met is adjusted to suit Salminen's diary. 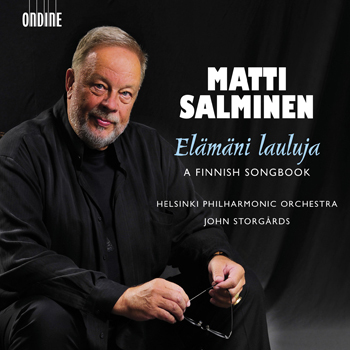 On this new recording (entitled Elämäni lauluja - "Songs of my life"), Matti Salminen performs rarities offside the standard repertoire and delivers a personal account of orchestral songs from compatriot Finnish composers, including the great Jean Sibelius. Accompanied by the Helsinki Philharmonic Orchestra under its new chief conductor John Storgårds, Salminen is completely at home singing this music. Many of these songs about nature and love deserve greater attention or discovery, and this exceptional disc represents an ideal vehicle.